West Ham line up Everton defender | The Transfer Tavern | Where football transfer rumours fly or die! The transfer discussion in the Football Transfer Tavern is hoting up around the snooker table today after talkSPORT reported that West Ham United want to sign Everton centre back Sylvain Distin, which in turn could pave the way for James Tomkins to join Newcastle United. Sam Allardyce is lining up a move for the Toffees defender, who is out-of-contract in the summer, and his potential arrival could spell the end for Tomkins at Upton Park. 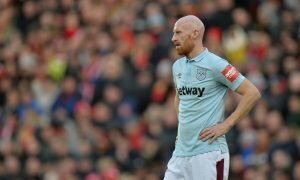 Tomkins has only started 11 Premier League games this term with Allardyce preferring James Collins and Winston Reid as the centre back pairing and the academy product has been played as a makeshift right back instead. If Distin arrives at Upton Park that could limit Tomkins’ role further and see him being shipped out to Newcastle with Alan Pardew poised to renew his interest in the defender with his squad looking increasingly thin. Could Distin’s possible arrival spell the end for Tomkins at Upton Park? Vote in our polls below.